Another week, another coach gets fired and another team needs to be eliminated from the power rankings. This should have happened last year, but after only winning once in their last seven games heading into the bye week, Montreal was left with no choice but to fire Michel Therrien. He becomes the fifth head coach to get fired this season, but it was quite interesting to see many coaching changes happen towards January and February than when you usually see them in November and December. I’ve mentioned this in the blog post before, but it wasn’t until now that you are finally beginning to see the “haves” and “have nots” in the NHL. Beyond Colorado and Arizona, no one in the league was claiming to be terrible. Along with that, the market for veteran former NHL head coaches was quite barren until this past month when Ken Hitchcock and Claude Julien were let go. Surely enough, Montreal decided to make their move when Julien became available, despite the fact that they were leading the Atlantic Division standings. Time will tell if other teams will decide to make a move by the trade deadline. In the meantime, let’s start this week’s edition of the Nerdy 30 with the next team eliminated from playoff contention: the Dallas Stars. All year, the Dallas Stars have not looked the team they were from last year. Plenty of their best players have either aged terribly and/or have missed significant time due to injury. Along with that, their goaltending still hasn’t gotten better and their offense can no longer mask how much of a disgrace it is. However, saving the puck isn’t the only reason the Stars have the second worst goals against total in the NHL. Consider that the Stars gave up an average of 55.5 shot attempts per hour at even strength last year: good for being tied with Toronto for the 19th best rate in the NHL. This year, that number has increased to the fourth worst rate in the league at 58.5 attempts per hour. The addition of Dan Hamhuis was supposed to help Dallas more than hurt them, and that is true based on underlying numbers. No other Stars defenseman has played over 500 minutes and has given up less on-ice goals per hour than the former Canuck has (1.89) and only Stephen Johns has given up less on-ice shot attempts per hour (56.7) than him (56.8). If anything, Dallas’ performances in defense almost go hand in hand for how well John Klingberg’s season is. Consider that Klingberg had Alex Goligoski as his most common partner last season. Together, they played with 55.7% on-ice puck possession and 55.43 on-ice shot attempts given up per 60 minutes. This season, those numbers have dropped to 49.7% and 59.0 attempts per hour, respectively. That is all to do with the fact that Goligoski signed with Arizona during the offseason and Esa Lindell is Klingberg’s usual partner in defense. That’s not ideal at all considering that the 22-year old Lindell is playing his first full season in the NHL and his analytics have already shown that he is one of the worst defensemen on the team in on-ice shot suppression. In the meantime, Klingberg, Hamhuis and Jordi Benn have been the only Stars defensemen to have played over 50 games this season with the rest either missing time to injury or not being counted on completely by head coach Lindy Ruff. It is quite clear that in the long term, Dallas has to find another three or more defensemen that they can count upon to fill in a playoff caliber blue line. As for their penalty kill, there’s no one bigger to blame for their struggles than Kari Lehtonen. This season, no other goaltender has played over 100 penalty kill minutes and come within 1.5% one than Lehtonen’s league worst 81.0% save percentage. If it weren’t for Lehtonen’s incompetence, Dallas’ league worst 50 goals against while shorthanded would be more line 34 goals against according to corsica.hockey. Still, that 34 expected goal output is the sixth worst in the NHL and that is more to do with them being in the bottom half in the NHL in shot attempt and unblocked shot attempt suppression than it is in scoring chance suppression (15th best in the NHL). Tyler Seguin and Jamie Benn will always be the two reasons Dallas will be a competitive franchise in the long term, but no longer can general manager Jim Nill surround them with aging and ailing veterans and talentless rookies to mask their biggest weaknesses. It will be summers like this upcoming one that will show how strong the Stars front office really is. Since I last wrote about the Flames, they have gone 4-2-0 while going neck and neck with the Los Angeles Kings for the final playoff spot in the Western Conference. However, their 18-16 tally during that six game span suggests plenty of offense has been generated with no one knowing what it takes to stop the puck. It will just have to be accepted that the Brian Elliot-Chad Johnson tandem has been, at best, a temporary failure that just won’t go away this season. So instead, let’s talk about Calgary’s skaters. Amazingly, their 52.1 shot attempts against per hour is the fourth best rate in the NHL. However, shot charts such as this one and their subpar scoring chance rate suggests that there has been too much concentration blocking shots from the point and not enough focus at preventing any shots coming from in front of the net. Meanwhile, any offensive category you can find sees them within the middle third in the league. Yes, Johnny Gaudreau has missed 10 games due to injury this season, but it is quite amazing to see Mikael Backlund be the leading scorer on the team with 39 points. However, the second line trio of him, first round pick Matthew Tkachuk and Michael Frolik could be among the best second lines in the entire NHL. All three of them have seen their on-ice shot attempts go over 54.5% in their favor and have combined to score 39 goals and rack up 106 points. For Tkachuk, only Mitch Marner has racked up more assists than his 25 while being under 20-years old. Clearly, he has been a massive hit as the sixth overall pick. Still, all eyes will be on Gaudreau and figuring out how to get the most out of him. If this season were to end, his individual (7.9%) and on-ice shooting percentages (5.4%) would be the worst of his career by far. 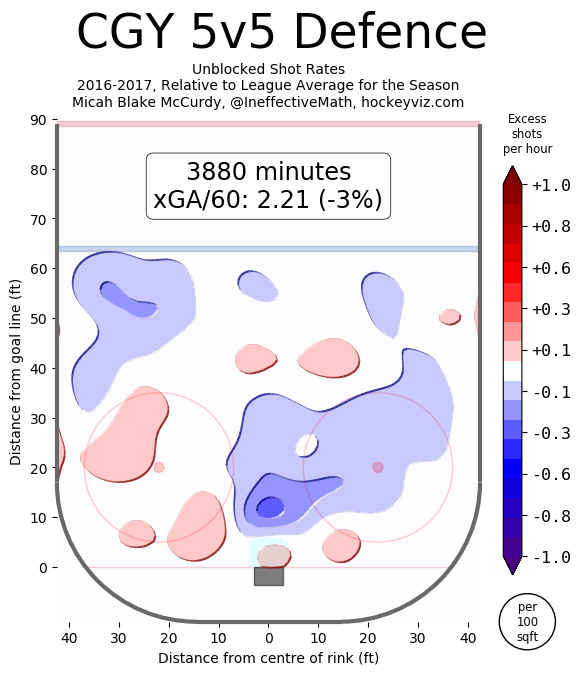 His 3.3% shooting percentage while on the power play would also be more three times less than his any full season-long shooting percentage during his NHL career. Having Alex Chiasson and Troy Brouwer as your most common forward linemates outside of Sean Monahan does not help matters as both have averaged less than 1.1 points per hour at even strength and have consistently been below league average when it comes to contributing in on-ice scoring events (in other words, they both have been below 66.7% at individual points percentage for the majority of their careers). That leaves Sam Bennett as the last teammate upfront that has played more than 10% of Gaudreau’s minutes together. Sadly, Gaudreau has seen his puck possession drop to 45.2% while playing with the former first round pick rise to a whopping 52.7% while playing apart from him. Clearly, the need for a top line right wing will be a must in the offseason, no matter how Calgary finishes this season. But in the meantime, someone beyond the second line plus Gaudreau and Monahan will have to step up offensively for this team to have prosperity in the postseason. After starting off the season so well, the Canadiens have fallen by the wayside and are in desperate need of a pick-me-up if they ever want to make a deep playoff run. This season can easily be divided into three parts. The first part is their 16-4-2 start despite expecting to be outscored 55-61.2 according to corsica.hockey. Montreal outscore the opposition 67-47 and generated an eighth-best 52.8% of adjusted even strength puck possession during that time frame. Along with that, their power play got off to a 23.1% start and their penalty kill was performing well above 83%. From the Sunday after Thanksgiving until the end of January, the Canadiens were beginning to regress to the mean. The team went 14-10-5 during that and was on pace for 93 points if they continued their results over an 82-game span. Along the way, their 89-80 scoreline almost matched their expected output of 88-81.3. Montreal’s power play also continued to buzz over 20% while only seeing their adjusted even strength puck possession of 55.6% be bettered by Washington’s 56.1%. However, their penalty kill began to flounder as the unit gave up 23 goals out of 97 attempts. Then, the wheels came off. Not only have the Canadiens been outscored 10-22 and their penalty kill continues to perform below an 80% success rate, but their power play has only scored 1 goal in their last 19 tries. Amazingly, their expected goal total this month was supposed to be 17-16.7, so surely good times are ahead, right? First, Carey Price’s save percentage while shorthanded has to get better. This season, he is 35th among the 41 goaltenders with over 100 shorthanded minutes under their belts at 85.6%. If this season were to end, it would be the worst shorthanded save percentage in his career since the lockout-shortened 2012-13 season (82.7%) and the lowest among all 82-game seasons since the 2008-09 campaign (84.0%). This poor season in that situation if enough for Montreal to leak in 10 more goals than they should have all season according to corsica.hockey. The skaters have helped out by suppressing a sixth best shot attempt suppression rate, but their 21.6 scoring chances per hour is just 16th best in the NHL. That might make things more stressful for any goaltender, especially one coming off a “sprained” MCL like Price had last season. Along with that, Montreal’s offense has only been able to score three or more goals in six of their last 18 games. Still this is the fourth best shot generation team at even strength we are talking about at 58.9 attempts per hour. You would like to think they have a clue how to put pucks in the net, especially with every player healthy right now. However, they might have to change things up on the power play. While the unit is still at 21.3% for the season, they have relied so much on their league-leading 19.7% shooting percentage to compensate for their league-worst shot generation of 80.3 attempts per hour. As a result, their expected goal total should have been 21.4 in man-up situations instead of 37. That would make the power play click at an embarrassing 12.1% success rate if life went according to plan. Thank goodness it didn’t and that’s why after being behind the bench for so long, Michel Therrien had to go. Here’s hoping Claude Julien can remember what it is like to coach a team with a psychopath of a general manager. Like Montreal, New York’s season can be divided into three parts. Part one is their 28-13-1 start that went all the way until January 7th. They outscored the opposition 94-81 at even strength, yet the scoreline really should have been 85.3-84.2. What gave the Rangers the run that they had was their successful power play. During that time, they achieved a 23.2% success rate and their 29-goal output was not that far off their 28.3 expected total. Afterwards, the team returned to Earth with a 3-5-0 stretch and getting outscored 25-28. However, that scoreline should have been 24.2-21.3 and the team only gave up 17 penalty kill situations despite being unsuccessful in four of them. Until last night’s loss to the Islanders, the Rangers rebounded with a six game winning streak. What has been interesting is the team is relying on puck luck again to deliver the same success they had earlier in the season. New York’s 23-16 scoreline this month really should be 18.1-18.7. That being said, the power play continues to sputter by only scoring three times in their last 18 attempts. All three time periods have shown that New York’s power play coincides with their expected goal output, so it is really difficult to see how their overall shot generation is not directly correlated to their power play scoring. As for their even strength play, the Rangers continue to be one of the worst in shot attempt numbers, yet one of the best in shot quality. Despite having puck possession that hasn’t moved away from 47-48% all year, their expected goals for percentage also hasn’t moved away from 51% either. That is because New York is the fifth best team in the NHL with their 9.13 scoring chances for per hour. It’s numbers like these that prove why their always high shooting percentage stays consistent and why they won’t be going away from 110 standings points anytime soon either. Let us all decorate every crevice of our dwellings with lucky rabbits foots and prey that Barry Trotz doesn’t play Tom Gilbert over Nate Schmidt and Dmitri Orlov at any point this entire season.